Many people also know of the classic way of categorising work in terms of its importance and urgency. The four quadrants popularized in Covey's “The Seven Habits of Highly Effective People” and other titles. The pie charts give examples of what is probably currently happening within your Enterprise and what perhaps may be the target. People generally have an innate and uncontrollable desire to work on things in the Firefighting quadrant and people who are responsible for these people tend to reinforce this innate behaviour in the people who report to them - for the behaviour is innate in them too. There is nothing wrong with these people. There are no bad people, only bad environments. Doing Firefighting type work tends to be both rewarding and rewarded. And this innate behaviour is massively reinforced by the environment people work within that is constantly calling for quick wins, low hanging fruit, meeting of deadlines, etc. People (from the US) who spend most of their time in that quadrant are known as MVP’s - Most Valued Player. 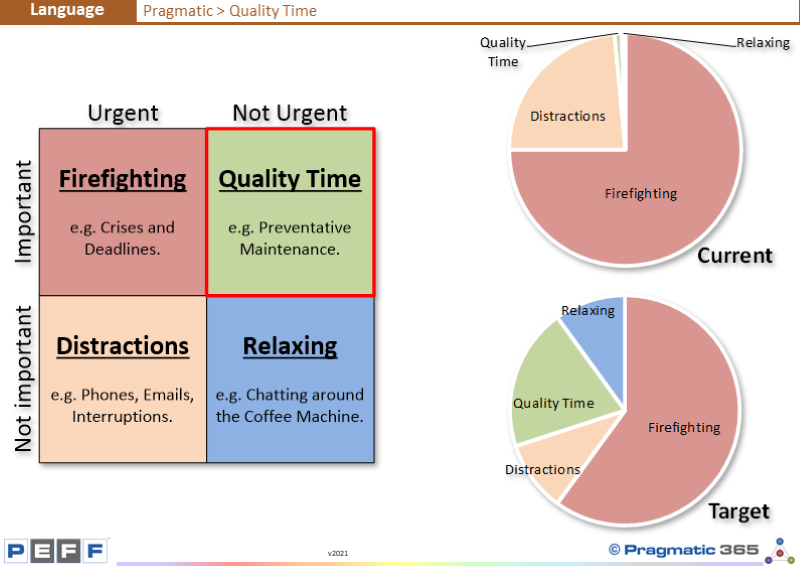 Put simply, being Pragmatic means - Balancing Important / Non Urgent things with Important / Urgent things. Is your Enterprise allowed to work on Important Non Urgent things? Are people allowed to spend enough time on Important Non Urgent things? If people were allowed to spend more time on Important Non Urgent things, do you think there would be benefits? What would the benefits be and can you quantify them?